The jewel in the crown of Provence. Intimate streets and sun-kissed stone. The Cours Mirabeau, its main street, is a delightful tree-lined meander of cafés, restaurants and shops. Also worth a visit is the Cathedral of St. Sauver and, naturally, the city's famous Cézanne Museum. Aix-en Provence is to be enjoyed especially in the morning, where hours could be spent wandering through the labyrinth of cobbled streets that make up old town. Here you will uncover a wealth of boutiques, daily markets, restaurants and shops. The perfect place to stop and enjoy an al fresco meal or drink – weather permitting. The city is also a perfect jumping off point to explore some of the other sights in Provence, including Arles, les Baux de Provence, the Luberon and Mont Saint Victoire. Situated in the Rhone Delta, this small but important town is steeped in art history, with important works by David Hockney, Francis Bacon and Van Gogh to be found alongside the impressive Saint Trophime Church. With the historic centre of the town nestled within its imposing medieval walls, Avignon has been a UNESCO world heritage site since 1995. Its most famous attraction, the 11th century Palace of the Popes, is a must on any sightseer's itinerary. These ancient remains of a former town of more than four thousand inhabitants dates back some eight thousand years. With renovation of some of the dwellings occurring since the 1970s, Les Baux de Provence offers the opportunity for a unique glimpse back into our distant past. 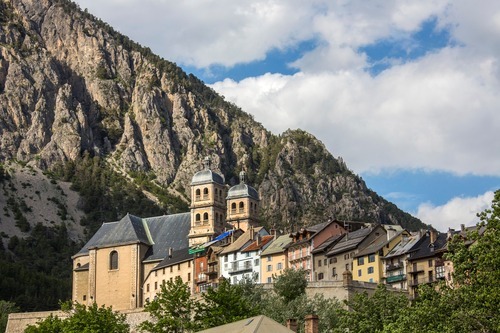 At a height of 4350 feet (1350 metres, Briançon is the highest city in the European Union and the second highest in the continent after Davos in Switzerland. With breathtaking views of the Hautes Alpes, and the locally situated Les Encrins national park, this regional capital is another worthwhile addition to a tour of Provence. A nature reserve situated in the Rhone Delta, where you will find the famous white horses, and locally bred bulls as well as exotic wildfowl such as pink flamingoes. Cuges-les-Pins offers a welcome alternative for travellers staying in Gites in Provence with their children. The 'OK Corral', which as the name suggests, is essentially a wild west theme park, offers activities and rides for children of all ages. Not quite the traditional flavour of Provence but well worth a visit when in the area.